My roommate and I have been on a “watching the classics” kick: If the weather is crummy, we hole up on the couch to watch classic films we missed somewhere in the last 50 years or so. So far, this has included watching the entire Dirty Harry series, with giggling glee at how scary and intimidating Clint Eastwood is. 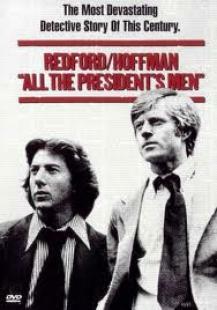 Lately, we have transitioned into catching up on all the Robert Redford classics: Sneakers, Operation Condor and, last night, All the Presidents’ Men. This American classic tells the story of how two slightly goofy Washington Post reporters unearthed the Watergate scandal. There were a few moments in this movie that blew my mind. Not because of the insight they provided on an American scandal, but because of the insight they provided on how people used to work. In this clip, Woodward (Robert Redford) consults with a Washington Post archivist to find information about one of the targets of the investigation. After “looking through the clip files”, she comes back with a tiny clipping, which eventually sets Woodward on a fruitful course of sleuthing. The clip files! We paused the movie. I’m 30 years old. Since I was a freshman in high school, I have had access to the Internet. Since I was a freshman in college, I’ve used Google. Since I have been in the working world, I’ve used mobile phones to search the Internet. I’ve never had to embarrass myself in front of my boss by asking who Colson was. I’ve never spent hours poring over files of paper to do research. To just the last two steps. As an adult, every learning challenge I’ve faced is not a challenge of finding information. It’s the challenge of finding the right information. Bob Woodward re lied on archivists or chance encounters to locate raw data. I’ve got Google to do that. The modern, information-empowered worker skips step one and goes straight to the processing, application and analysis of information. Now, that’s also old news. What’s new is applying this way of thinking to the learning and development professional’s workflow. Since you’re not the archivist anymore, what can you do to make your colleagues more effective? The competitive advantage for the 21st century will be who can use information most efficiently and effectively. You can do your job by sorting through content and curating it for your colleagues or by connecting them to one another and building networks where finding the valuable information nugget is easy.